The defining characteristic of the United States at its inception was personal liberty. The entire framework of the government was constructed around the idea that while a federal government was a necessity, it must be limited to as small a scope as is possible to achieve the effect set forth in the Constitution. The framers of that document believed that the wording of the Constitution itself was enough to reveal when and where and how the federal government was permitted to act. However, one clause of the Constitution created great apprehension: the Necessary and Proper clause. This clause was enough to scare a large group of representatives into requiring that a bill of rights be drafted and included as amendments to the Constitution at ratification. Those who argued against the bill of rights did so because they believed that the federal government was already limited to those powers specifically set forth in the Constitution and was therefore incapable of encroaching on the rights of its citizens. Over time, the federal government has found ways to expand its power while an apathetic population stood by as rights were infringed upon and even forfeited rights willingly. Today we are at a point in history where people seem to have no regard for whether the Constitution even matters. Forget about arguing whether it says one thing or another, we are at the point where there is a complete disregard for whether it says anything. Congressmen have stated that due process is getting in the way of new laws. Our federal government has been shown repeatedly to be spying on its citizens. We overwhelmingly have the largest prison population in the world. We’re in the middle of a war on drugs and a war on terror and both of the things we’re supposed to be fighting have only gotten worse. We’ve been attacked repeatedly by soldiers of an army that wears no uniforms but surrenders itself repeatedly to suicidal destruction, but we’re more worried about why the government won’t throw due process aside and prevent people from buying weapons. Meanwhile, our government, the same government people want to be in control of firearm sales, has given weapons to drug cartels, gangs, and other criminals, all within the United States or surrounding countries. We haven’t even discussed how many differing factions we’ve provided arms to, often to see them turned around and used against us. We get caught up in talking about what type of guns we should be able to use for personal defense or hunting, but we forget that the second amendment was written to detract the federal government from believing that its citizenry wouldn’t fight back in the face of tyranny. We don’t need semi-automatic weapons for hunting. We need them because the greatest threat to the United States is an attack on personal liberty, and the greatest threat to personal liberty is a tyrannical government. 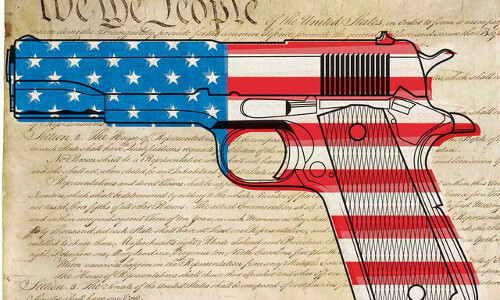 A Well-Regulated Modern MilitiaWill God Destroy America?